For every excellent feature our favorite motorcycles have, there’s often a small price to be paid in terms of mechanical technicality or creature comforts. In the case of our Triumph Street Triple R, that bounce back arrives in the form of stock mirrors that aren’t as adjustable as we’d like. By “we”, I mean T.R.O. author Margaret Dean and myself. We share the Street Triple R using custom seats that are tailored to our height and personal preferences. Because I sit taller, my line of sight is higher than hers. In concert with her preferred lever position, the motorcycle’s mirrors (mounted on the very same clamp as the levers) cease to deliver a clear field of view as there’s no inline joint to tilt their Y-axis. “You could get bar end mirrors” … suggests anyone who’s ever heard even an inkling of this dilemma. 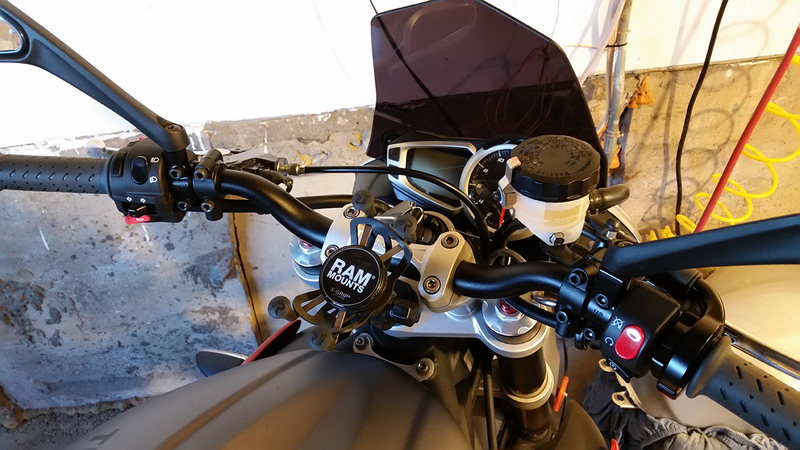 Triumph makes a beautiful (looking) set of bar ends that completely eliminate the need for stock mirror mounts. The down side is that they don’t perform well enough for long distance travel and, this being my wife’s dedicated sport tourer, she’ll be needing a clear 360 perspective. 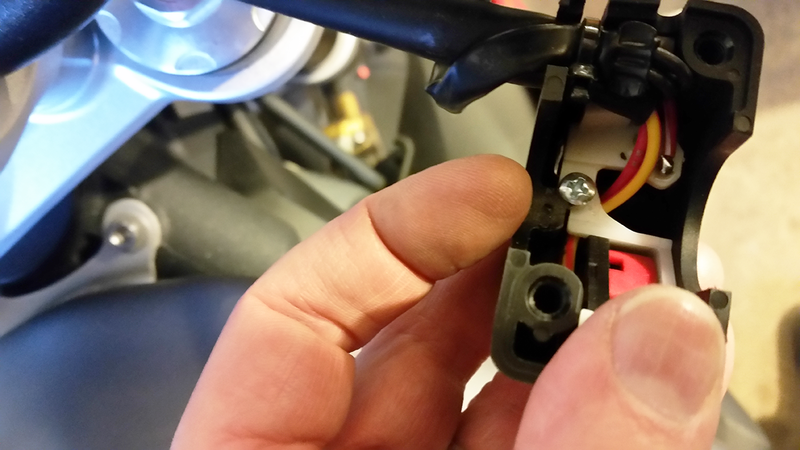 A bit of model-dedicated forum discussion produced these mirror mount clamps. Intended for 7/8″ handlebars, they make use of the same 8mm x 1.25mm (right hand threads) as those on our beloved Trumpet. A few day’s shipping and I’m back in my garage, albeit freezing, removing various controls from an otherwise perfect motorcycle. Making room for our new clamps is a challenge. Our soon-to-be mirror mounts must be positioned to the outside of what are now designated as “lever-only” brake/clutch clamps. 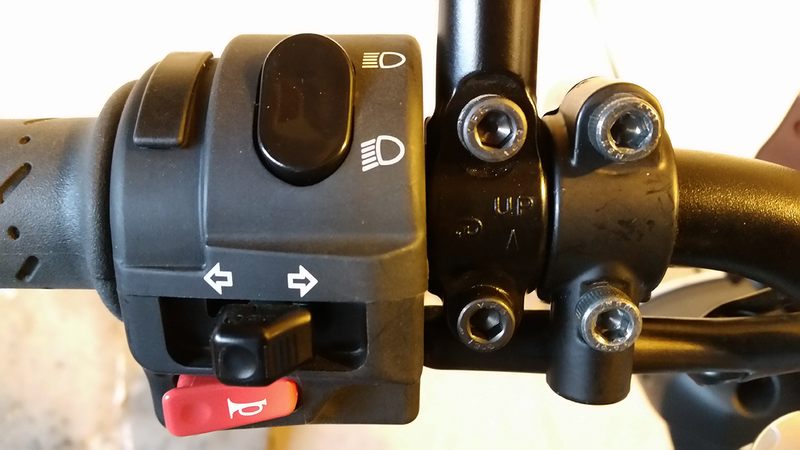 Better stated, the new clamps belong toward the ends of the bars (to the inside of the grips, of course). 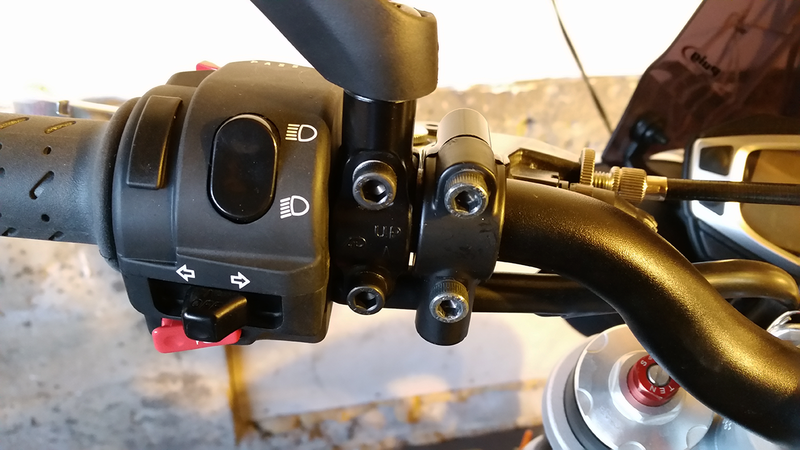 This is because the front brake master cylinder (right side) takes up a lot of remaining space. This changes the control lever “feel” though not necessarily for the worse as now there’s more leverage. 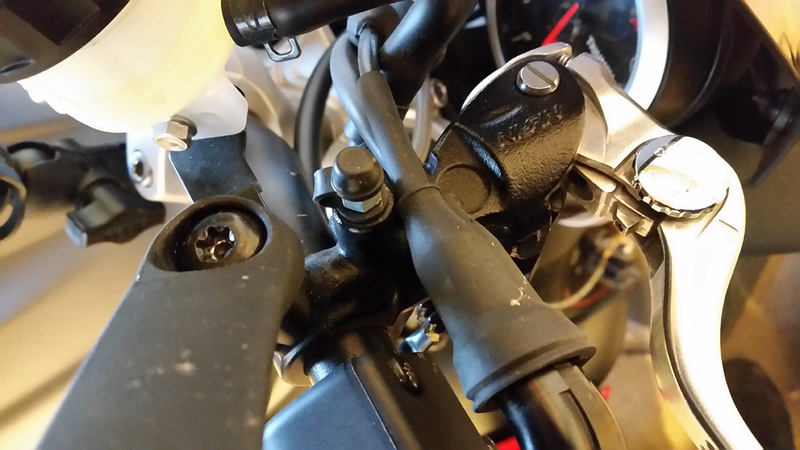 If you prefer the levers reach their full bar-end distance, you’ll have to install a different mount for the Triumph Street Triple R front brake master cylinder. Complicating things further, the STR’s ignition switch is notched, meaning it has a nub that’s intended for an outlet at the handlebars. I salute Triumph for both this and other measurement marks as it makes adjustment easier wherever you want to remain stock. 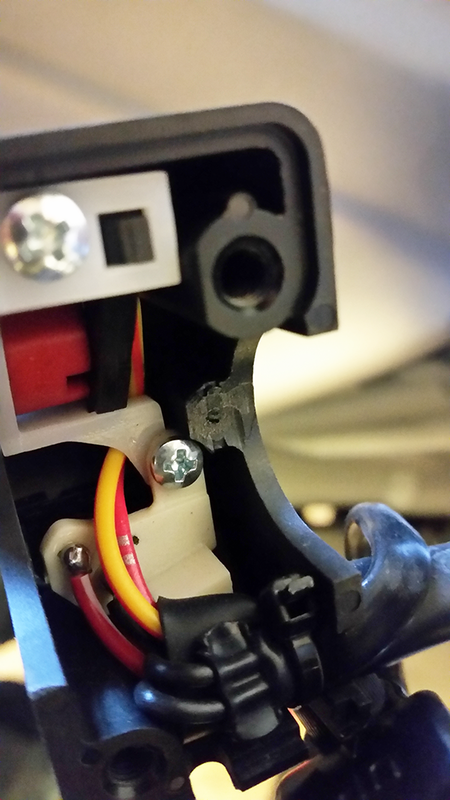 That’s not our goal here, however and staying the course means powering up the dremel before filing things down. Reshaped and sanded smooth, I’m faced with a sad realization: the outlets on these mirror mount clamps are too small for the inserts on the stock mirrors I’m relocating. Rethinking the aforementioned forum discussion makes my error clear. All parts new and old must be mixed and matched yin-yang style to gain the independent Y-axis that this entire effort is striving for. 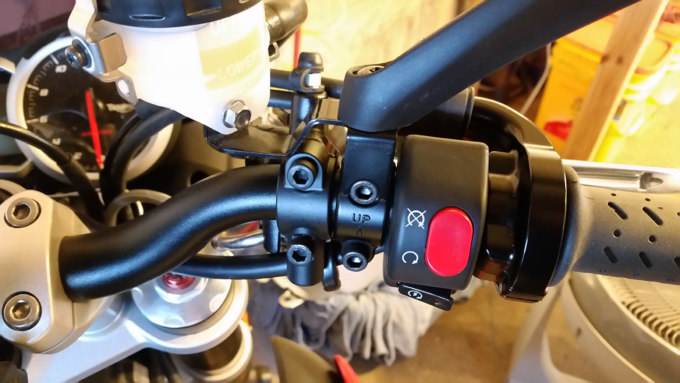 Our installation how-to for a 2016 Triumph Street Triple R uses universal 7/8 mirror mounts that can be placed near ANY motorcycle's brake/clutch clamps. 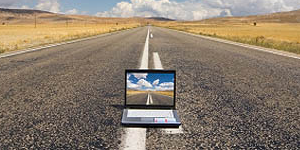 To get everything “just right”, meaning safely positioned and secured in a way that doesn’t pinch the ride-by-wire throttle or ignition harness, patience is key. Photos/notes regarding position and behavior help ease the effort to get everything lined up and fully functional. Once the controls are snugged, a test ride is in order (as soon as our Midwest winter temps rise above single digits). What Solutions Have You Devised For Your Otherwise “Dream” Motorbike? There are a lot of great DIY fixes out there. Which ones have you tried? Has it worked out for the better in the long run? Your input is invited. Post an article!